First Russian-Jewish Colony in Palestine. General Condition of the Colonies. Since the dispersion of the Jews from their native land, many efforts have been made to induce them to return to Palestine and engage in agriculture. Probably the first of these to lead to any practical result occurred in the nineteenth century; though in the travels of Benjamin of Tudela, and of Petaḥyah of Ratisbon, there are records of small settlements of Jews in the Holy Land dating as far back as 1170. Three centuries later Meshullam ben Menahem Volterra, of Florence, while traveling through Palestine (1481), found sixty Jewish families in Gaza on farms, where they cultivated the vine and raised cereals (see his , "Letter of Travels," ed. by M. Luncz, Jerusalem, 1882). When, at the close of the sixteenth century, Joseph Nasi, duke of Naxos, began to rebuild the city of Tiberias, "where only Jews were to dwell," he planted mulberry-trees to encourage the inhabitants in the breeding of silkworms. His contemporary, Moses ben Joseph of Trani, in his responsa (Venice, 1629, i. § 46), relates that the Jews of Palestine devoted themselves at that time to such agricultural pursuits as cultivating cotton, growing cereals, raising vegetables, planting mulberry-trees, breeding silkworms, and apiculture. These records show merely that agriculture was pursued, perhaps intermittently, by Jews in Palestine for several centuries; but they do not point directly to the founding of Agricultural Colonies as such. For the establishment of these one must look to comparatively modern times. 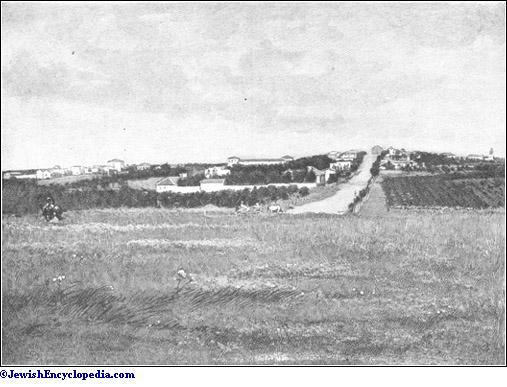 General View of the Rishon le-Zion Colony, Palestine. (From a photograph by I. Raffalovich and M. E. Sachs. )Sir Moses Montefiore. That Sir Moses Montefiore long cherished the idea of establishing Agricultural Colonies in the Holy Land is well known. On each of his seven visits there, he devoted much time and thought to the subject, particularly with reference to the problem of securing protection for the lives and property of any future colonists. Besides interviewing Boghuz Bey in 1838 ("Diaries," i. 199), on his second visit to Palestine, he held conferences with Israel Drucker (who had a farm at Djermek) and other landowners. On his fourth visit to the East, in 1854, he was received by the sultan and had an interview with the British Ambassador, SirStratford de Redcliffe, respecting the purchase of land in Palestine. After consulting with a committee, Sir Moses selected thirty-five families from Safed, and provided them with the means necessary to begin farming (ib. ii. 47). Previous to this, however, Colonel Gawler, an officer in the British army, had formed in London a colonization society for the same purpose (1845); but on account of the unsettled state of the country that followed the war between Turkey and Egypt (1839-40), the plans could not be realized. About 1860, several orthodox rabbis, among whom were Hirsch Kalischer and Elijah Gutmacher, developed a plan for the colonization of Palestine with Russian and Rumanian Jews; and this plan was soon after supported by the Maskilim (Progressists). The latter induced the Alliance Israélite Universelle, of Paris, to interest themselves in the matter, notwithstanding the circumstance that many members of the Alliance doubted the adaptability of the Jews to agricultural work. This organization sent Charles Netter as its representative to Palestine to investigate. On his return he advised the Alliance to make a beginning by establishing a school for the purpose of training in agriculture the Jewish children of Palestine and those of other Oriental countries. 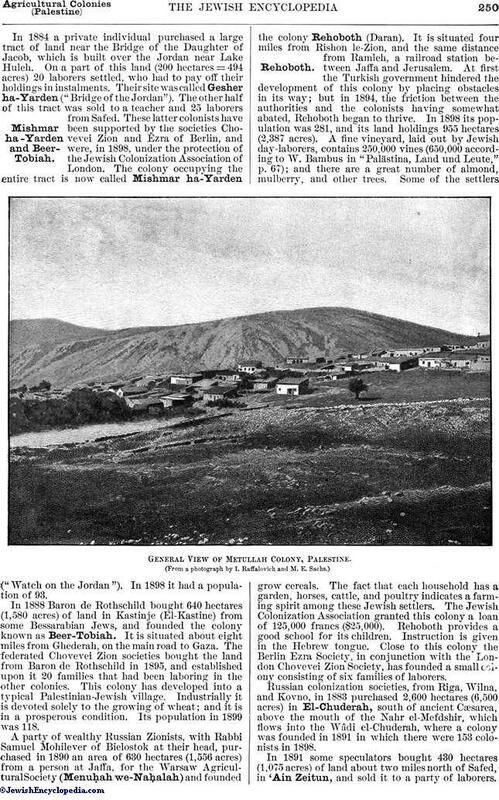 The Turkish government presented the Alliance with 250 hectares (617 acres) of land near Jaffa, on the road to Jerusalem; and in 1870 a farm-school was established, under the supervision of Charles Netter, at Miḳweh Yisrael. Here all branches of horticulture, especially viticulture, are taught after the most modern methods, and so successfully that the proceeds derived from the sale of the produce are sufficient to defray all expenses. Former pupils of the institution are employed as teachers of agriculture in several of the more recently founded colonies, while others have received employment in the adjacent Turkish provinces. The population of this colony in 1898 aggregated 225 persons, including 100 pupils in the school. 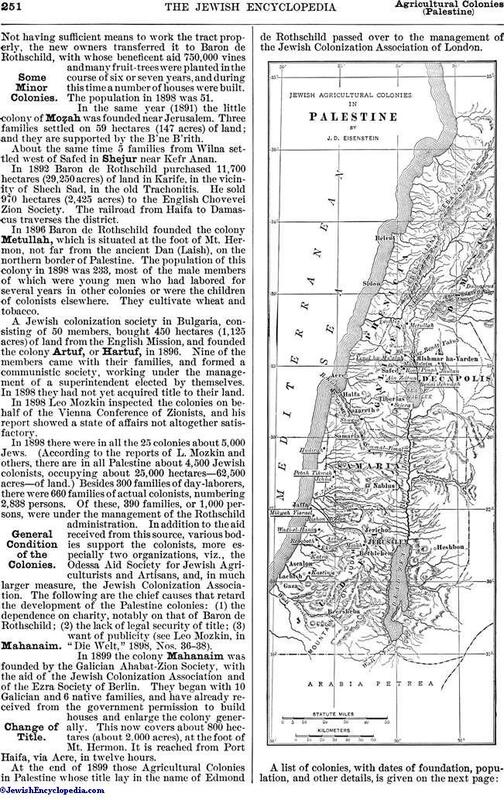 In 1878 the idea of the Jewish colonization of Palestine was again brought before the public by Laurence Oliphant and the Earl of Shaftesbury. This resulted in the purchase, by several Jews of Jerusalem, of 270 hectares (767 acres) of land from Selim Kassar, an Arab of Jaffa; and the colony of Petaḥ Tiḳwah was started. This colony forms a part of the village of Omlebish (Mulebbis), and is situated on the road to Nablus, near the river 'Aujeh, about six miles from the sea. Jaffa is only six or seven miles distant. The colonists that settled near the river sufered from malaria; and most of them were compelled to leave. In 1883 a part of their land was bought by a few immigrants from Bielostok, Russia. For these colonists the Russian Chovevei Zion Society ("Lovers of Zion") built eighteen houses on more healthful and higher ground; and the settlers, who began by raising cereals, soon turned to viticulture and the cultivation of fruit-trees. General View of Zikron Ya'aḳob Colony, Palestine. (From a photograph by I. Raffalovich and M. E. Sachs. )Baron Edmond de Rothschild. In 1887 Baron Edmond de Rothschild became interested in the colonies and bought some of the vacated land. He planted a number of eucalyptus trees around the marshes as a preventive of malaria. Emil Lachmann, of Berlin, another philanthropist, also bought a part of the land and planted a large orange grove and a number of grape-vines. Upon this tract there are now growing more than a million vines, besides a large number of orange-, lemon-, and other fruit-trees. Some of the colonists occupy themselves in growing wheat; others in the culture of silkworms. Another industry to which they give attention is floriculture. Thisbegan with the planting of the geranium, and led to the building, by Baron de Rothschild, of a perfume distillery. The total population of the settlement in 1898 was 802 persons. The persecution of the Jews in Russia in 1881 did more than any other event to bring about the practical colonization of Palestine by Jews; certainly, it gave it the first impulse. At that time emigration began in earnest, and Russian-Jewish refugees migrated in masses. In nearly every Jewish center of Europe emigration committees were formed. The emigrants organized themselves into small communities, such as the 50 families from Kiev and Elizabethgrad and the "'Am 'Olam" (Perpetual People), who migrated to the United States of America, and founded colonies in Louisiana and Dakota; and the Biluits, who selected Palestine as their future dwelling-place. Administration Building of the Zikron Ya'aḳob Colony. At first the colonization of Palestine met with little encouragement from the Alliance Israélite Universelle; and the communities that expected support from that body were greatly disappointed. But the strong faith and self-reliance evinced by those that did venture to Palestine convinced Baron Edmond de Rothschild of the possibility of successfully colonizing the country, and he took the colonies under his care. 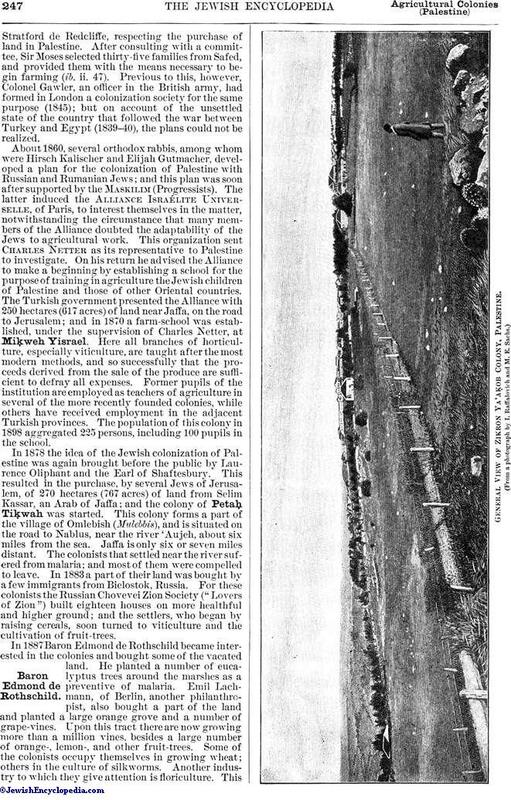 The year 1882 witnessed the foundation of the first of the Russian-Jewish Agricultural Colonies in Palestine. This community, which was called Rishon le-Zion (Ajun-Kara), consisted of only six Russian immigrants who established themselves on the road between Jaffa and Gaza, one hour and a half southeast from Jaffa and about one hour from the Mediterranean Sea, the site of the ancient En-hakkore (Judges, xv. 19). Soon after they had located themselves, Baron de Rothschild took them also in charge. The population of this colony, which covers an area of 618 hectares (1,545 acres), numbered 266 in 1890. Five years later it had increased to 450, and in 1898 to 531, exclusive of the members of the administration and of the day-laborers. The number of dwellings increased from 44 in 1890 to 62 in 1898. The chief products of the colony are wine and brandy, which are exported to Egypt, Constantinople, Russia, Germany, and to the United States. Over a million and a half of vines have been planted. An enormous cellar has been built, fitted with modern machinery and presses for the manufacture as well as the preservation of wine. Most of the grape-vines planted have been imported from America, and grafted with French varieties, the vines being thus made unsusceptible to the attacks of the phylloxera. The colony has produced as much as 15,000 hectoliters (396,300 gallons) of wine in a year, besides a quantity of good brandy. Over 20,000 mulberry-trees, used in silkworm culture, as well as a large number of fruit-trees, such as the almond, fig, pomegranate, apple, and citron, thrive in the settlement. Every family in the colony inhabits a stone dwelling, with a flower-and market-garden, and owns a horse and cart, together with at least one cow and some poultry. The indebtedness of each family to Baron Rothschild is being gradually liquidated. The colony supports a synagogue, a school, a public bath, a nursery garden, a library, a town hall, and a hospital. The internal affairs of the community are administered by an elective committee of settlers (Dalman in "Zeitschrift des Deutschen Palästina-Vereins," 1893, xvi. 194 et seq. ; "Palästina," 1892-98; "Die Welt," 1897, No. 27; Luncz, "Luaḥ," 1896-1900; Leo Mozkin in "Die Welt," 1898, No. 36). A party of ninety Russian-Jewish students, members of the Society Bilu, migrated to Palestine in 1882, and set to work as common laborers, hoping to save enough money to found a separate agricultural colony. They took for their motto the word (Bilu), which is an abbreviation made up of the initial letters of ("House of Jacob, come, let us go!"). These young men, some of whom were graduates of Russian universities, at first suffered many privations; but in 1884, through the efforts of Jehiel Michael Pinnes, together with a number of immigrants from Kharkov who purchased one-fifth of the land, they joined the Ghederah colony, which was started by the Chovevei Zion Society of Paris. Ghederah, named after the village of Katra, is situated about four miles southwest of Ekron, and covers an area of 330 hectares (815 acres). One-fourth of this is under wheat; and on the remainder about 200,000 grape-vines and different kinds of fruit-trees have been planted. The colonists have a synagogue, a school, and a pharmacy. In 1898 twenty families settled in the colony, and the total population amounted to 130 (Mozkin makes the number 69). This colony was supported by the Russian Chovevei Zion Society; but recently it has been taken under the protection of the Jewish Colonization Association of London. Reuben Lehrer, of Kherson, bought, likewise in 1882, 135 hectares (336 acres), in Wâdi-el-Ḥanin, about two miles from Rishon le-Zion, and founded a colony called Naḥalat Reuben, by selling some of the land to Russian immigrants. In 1896 the settlement numbered 18 families, or about 100 individuals, and in 1898 had increased to 121 persons. It has a large orange-grove, 150,000 grape-vines, and many thousands of fruit-trees of various kinds. The founder, Reuben Lehrer, occupies himself with apiculture. In 1895 his 200 hives brought an income of 4,000 francs ($772). The colony received support from the Odessa Aid Society, and recently the Jewish Colonization Association of London granted it a loan of 100,000 francs ($19,300). 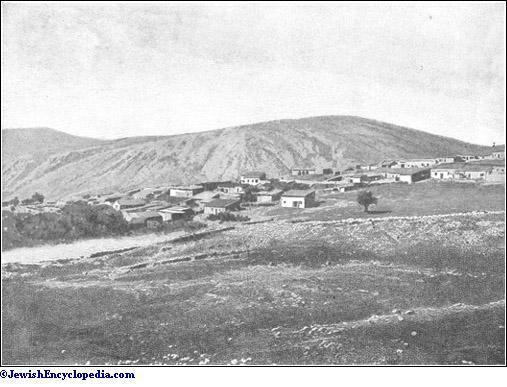 In 1882 some Jewish immigrants from Rumania founded the colony Zikron Ya'aḳob in Samaria. This is the largest and finest of all the colonies in Palestine. It lies about four miles east of the Mediterranean, and about ten miles from Haifa. The population is about 1,000 (200 families), and the tract occupied is about 1,454 hectares (3,635 acres). The colonists engage in various occupations, such as growing wheat, breeding silkworms, keeping bees, and raising vegetables. As evidence of theprosperity of the colony, reference must be made to the possession of a steam-plow, a steam-mill, an aqueduct, a large nursery-garden, paved streets, spacious wine-cellars, a library, a school, a synagogue, and a hospital. Further evidence of this is the establishment of the following branches: Tantura, the ancient Dor, now called Aḥot Zikron Ya'aḳob, situated four miles north, founded by Baron Edmond de Rothschild, with 20 families and some laborers who had worked in a glass factory which had to be given up, owing to the poor quality of the sand used; Shefeya, with 20 families; Em el-Gammal (Umm al-Jimal), with 4 families; and Em el-Tut (Umm al-Tut). According to the latest information, the Zikron Ya'aḳob colony, with its branches, has a population of about 2,000. In the same year (1882) some immigrants from Rumania founded the colony Rosh Pinah (Jaunah). No Jewish settlement in Palestine is more picturesquely situated. It lies about four miles north of Safed, on the slope of a mountain, and commands a magnificent view of Mt. Hermon and Lake Huleh (Merom). It covered 640 hectares (1,581 acres), which, in 1896, supported a population of 400, in 70 families, or, according to W. Bambus, 80 families, or about 500 souls. In 1898 the population had decreased to 315. The settlement possesses 60 houses, a small park, all the necessary communal buildings, a silk-factory (affording employment to some fifty lads from Safed), about half a million grape-vines, and about 20,000 mulberry-trees. In 1883 immigrants from Russian Poland founded the colony. Yesod ha-Ma'alah (Izbaid or Ḥurbat Zubad). They encountered difficulties, but many received aid from the Chovevei Zion of Russia and Baron de Rothschild. The settlement, located on the shores of Lake Huleh, occupied a tract of about 228 hectares (563 acres), and had a population of 100. Its irrigation facilities are unusual, receiving, as it does, an inexhaustible supply of water, by steam-power, from Lake Huleh. Large nursery-gardens and the cultivation of roses on an extensive scale constitute the chief industry of the colony. Attar of roses is made at a distillery erected by Baron de Rothschild. Some of the minor occupations, from which an additional income is derived, are fishing in Lake Huleh and cattle-breeding. General View of Rehoboth Colony, Palestine. (From a photograph by I. Raffalovich and M. E. Sachs. )Mazkeret Bitya. 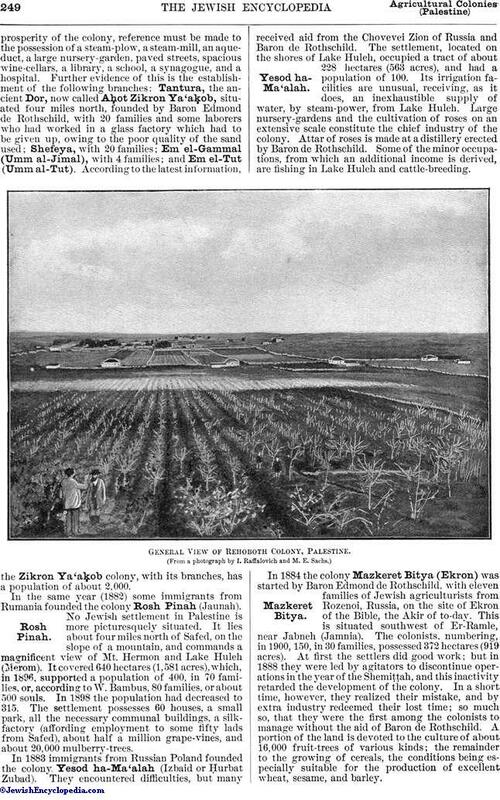 In 1884 the colony Mazkeret Bitya (Ekron) was started by Baron Edmond de Rothschild, with eleven families of Jewish agriculturists from Rozenoi, Russia, on the site of Ekron of the Bible, the Akir of to-day. This is situated southwest of Er-Ramle, near Jabneh (Jamnia). The colonists, numbering, in 1900, 150, in 30 families, possessed 372 hectares (919 acres). At first the settlers did good work; but in 1888 they were led by agitators to discontinue operations in the year of the Shemiṭṭah, and this inactivity retarded the development of the colony. In a short time, however, they realized their mistake, and by extra industry redeemed their lost time; so much so, that they were the first among the colonists to manage without the aid of Baron de Rothschild. A portion of the land is devoted to the culture of about 16,000 fruit-trees of various kinds; the remainder to the growing of cereals, the conditions being especially suitable for the production of excellent wheat, sesame, and barley. In 1884 a private individual purchased a large tract of land near the Bridge of the Daughter of Jacob, which is built over the Jordan near Lake Huleh. On a part of this land (200 hectares = 494 acres) 20 laborers settled, who had to pay off their holdings in instalments. Their site was called Gesher ha-Yarden ("Bridge of the Jordan"). The other half of this tract was sold to a teacher and 25 laborers from Safed. These latter colonists have been supported by the societies Chovevei Zion and Ezra of Berlin, and were, in 1898, under the protection of the Jewish Colonization Association of London. The colony occupying the entire tract is now called Mishmar ha-Yarden ("Watch on the Jordan"). In 1898 it had a population of 93. In 1888 Baron de Rothschild bought 640 hectares (1,580 acres) of land in Kastinje (El-Kastine) from some Bessarabian Jews, and founded the colony known as Beer-Tobiah. It is situated about eight miles from Ghederah, on the main road to Gaza. The federated Chovevei Zion societies bought the land from Baron de Rothschild in 1895, and established upon it 20 families that had been laboring in the other colonies. This colony has developed into a typical Palestinian-Jewish village. Industrially it is devoted solely to the growing of wheat; and it is in a prosperous condition. Its population in 1899 was 118. A party of wealthy Russian Zionists, with Rabbi Samuel Mohilever of Bielostok at their head, purchased in 1890 an area of 630 hectares (1,556 acres) from a person at Jaffa, for the Warsaw Agricultural Society (Menuḥah we-Naḥalah) and founded the colony Rehoboth (Daran). It is situated four miles from Rishon le-Zion, and the same distance from Ramleh, a railroad station between Jaffa and Jerusalem. At first the Turkish government hindered the development of this colony by placing obstacles in its way; but in 1894, the friction between the authorities and the colonists having somewhat abated, Rehoboth began to thrive. In 1898 its population was 281, and its land holdings 955 hectares (2,387 acres). 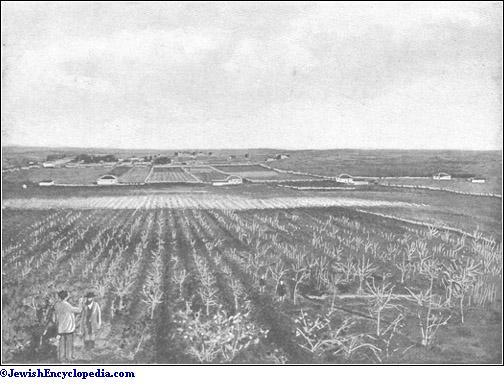 A fine vineyard, laid out by Jewish day-laborers, contains 250,000 vines (650,000 according to W. Bambus in "Palästina, Land und Leute," p. 67); and there are a great number of almond, mulberry, and other trees. Some of the settlers grow cereals. The fact that each household has a garden, horses, cattle, and poultry indicates a farming spirit among these Jewish settlers. The Jewish Colonization Association granted this colony a loan of 125,000 francs ($25,000). Rehoboth provides a good school for its children. Instruction is given in the Hebrew tongue. Close to this colony the Berlin Ezra Society, in conjunction with the London Chovevei Zion Society, has founded a small colony consisting of six families of laborers. General View of Metullah Colony, Palestine. Russian colonization societies, from Riga, Wilna, and Kovno, in 1883 purchased 2,600 hectares (6,500 acres) in El-Chuderah, south of ancient Cæsarea, above the mouth of the Nahr el-Mefdshir, which flows into the Wâdi el-Chuderah, where a colony was founded in 1891 in which there were 153 colonists in 1898. 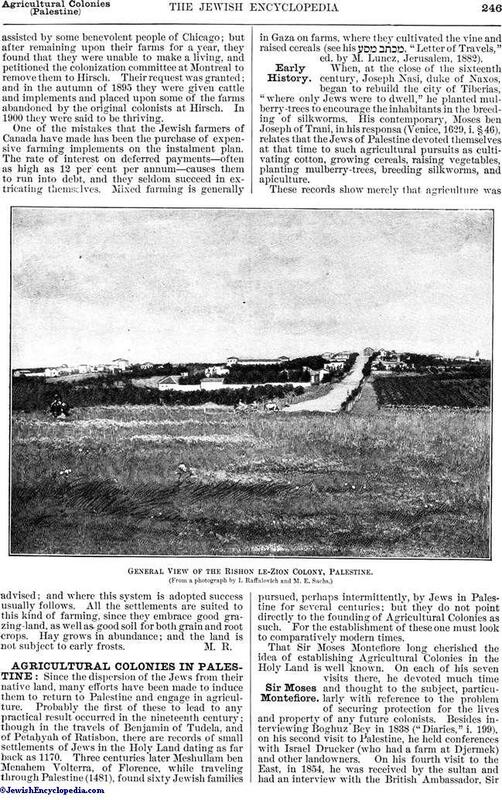 In 1891 some speculators bought 430 hectares (1,075 acres) of land about two miles north of Safed, in 'Ain Zeitun, and sold it to a party of laborers.Not having sufficient means to work the tract properly, the new owners transferred it to Baron de Rothschild, with whose beneficent aid 750,000 vines and many fruit-trees were planted in the course of six or seven years, and during this time a number of houses were built. The population in 1898 was 51. In the same year (1891) the little colony of Moẓah was founded near Jerusalem. Three families settled on 59 hectares (147 acres) of land; and they are supported by the B'ne B'rith. About the same time 5 families from Wilna settled west of Safed in Shejur near Kefr Anan. In 1892 Baron de Rothschild purchased 11,700 hectares (29,250 acres) of land in Karife, in the vicinity of Shech Sad, in the old Trachonitis. He sold 970 hectares (2,425 acres) to the English Chovevei Zion Society. The railroad from Haifa to Damascus traverses the district. In 1896 Baron de Rothschild founded the colony Metullah, which is situated at the foot of Mt. Hermon, not far from the ancient Dan (Laish), on the northern border of Palestine. The population of this colony in 1898 was 233, most of the male members of which were young men who had labored for several years in other colonies or were the children of colonists elsewhere. They cultivate wheat and tobacco. 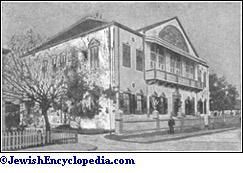 A Jewish colonization society in Bulgaria, consisting of 50 members, bought 450 hectares (1,125 acres) of land from the English Mission, and founded the colony Artuf, or Hartuf, in 1896. Nine of the members came with their families, and formed a communistic society, working under the management of a superintendent elected by themselves. In 1898 they had not yet acquired title to their land. In 1898 Leo Mozkin inspected the colonies on behalf of the Vienna Conference of Zionists, and his report showed a state of affairs not altogether satisfactory. In 1898 there were in all the 25 colonies about 5,000 Jews. (According to the reports of L. Mozkin and others, there are in all Palestine about 4,500 Jewish colonists, occupying about 25,000 hectares—62,500 acres—of land.) Besides 300 families of day-laborers, there were 660 families of actual colonists, numbering 2,838 persons. Of these, 390 families, or 1,000 persons, were under the management of the Rothschild administration. 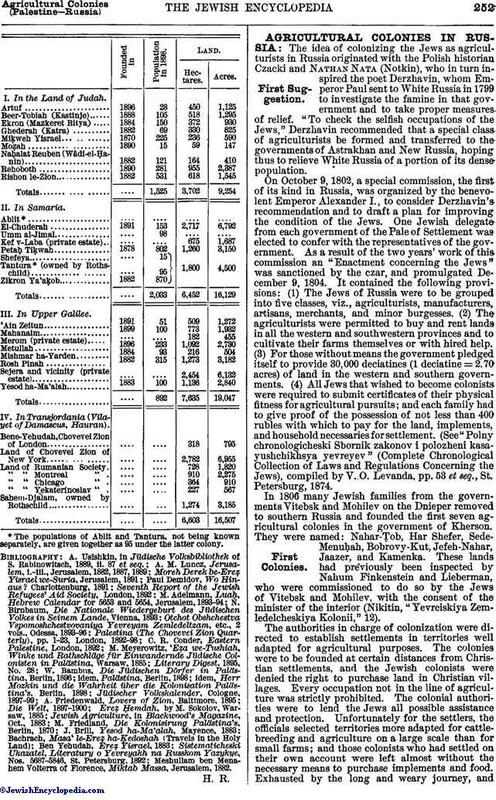 In addition to the aid received from this source, various bodies support the colonists, more especially two organizations, viz., the Odessa Aid Society for Jewish Agriculturists and Artisans, and, in much larger measure, the Jewish Colonization Association. The following are the chief causes that retard the development of the Palestine colonies: (1) the dependence on charity, notably on that of Baron de Rothschild; (2) the lack of legal security of title; (3) want of publicity (see Leo Mozkin, in "Die Welt," 1898, Nos. 36-38). 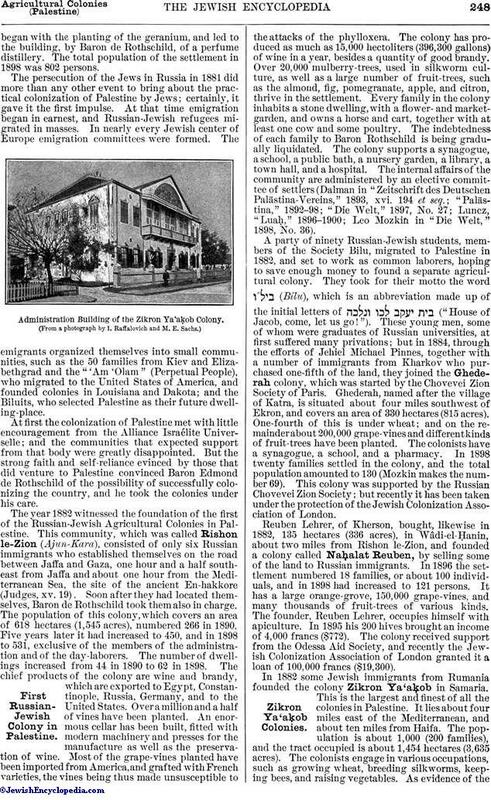 In 1899 the colony Mahanaim was founded by the Galician Ahabat-Zion Society, with the aid of the Jewish Colonization Association and of the Ezra Society of Berlin. They began with 10 Galician and 6 native families, and have already received from the government permission to build houses and enlarge the colony generally. This now covers about 800 hectares (about 2,000 acres), at the foot of Mt. Hermon. It is reached from Port Haifa, via Acre, in twelve hours. At the end of 1899 those Agricultural Colonies in Palestine whose title lay in the name of Edmond de Rothschild passed over to the management of the Jewish Colonization Association of London. I. In the Land of Judah. IV. In Transjordania (Vilayet of Damascus, Hauran). *The populations of Ablit and Tantura, not being known separately, are given together as 95 under the latter colony. Meshullam ben Menahem Volterra of Florence, Miktab Massa, Jerusalem, 1882.